Permanently removes swirls and light defects from all paints. Featuring Meguiars diminishing abrasive technology and safe for all paints, including use on Bodyshops (VOC Complaint), this superb product produces a swirl free gloss on all lightly marred paints. Buffing is smooth as it helps your machine glide over the surface, and wipe down is easy. 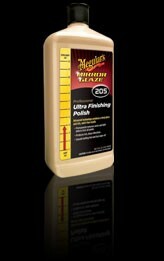 Cut level is 4 on Meguiars 12 scale so its suitable for finishing a heavily corrected surface after using #105 or as a one-step for light machine work. Use by hand, DA, orbital or rotary. "I Just wanted to say thanks for the super fast delivery. Just got the product and it was just what i needed. They don't even sell the product here in Finland. Quality of your work is suberb. Keep up the good work :D"